The hunt for a statement Menorah ends here. This work of art captures both the essence of the Chanukah season and the richness of Jewish heritage, with five exalted figures dancing with the Chanukah candles held aloft. 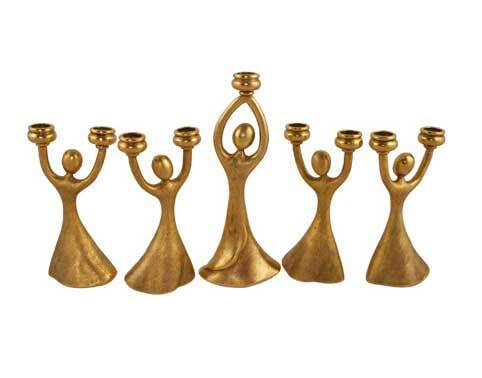 Each 5 ½” figure is constructed from high quality gold plated aluminum and will accommodate all standard candles. Different and distinctive, this artsy Menorah can be arranged as desired, and delivers nothing but delight.